More and more medical offices are requesting no strong scented perfumes, essentials oils, cologne or lotions. This is due to the amount of people who are easily affected by strong scents and can easily experience a flare up when at the doctor’s office. Medical offices have to address the issue as so many people can have severe sensitivities to smells that can lead to flare ups or shortness of breath. Upper and lower airway symptoms caused by chemicals and scents are very common in our society and it is becoming a preventative problem. But scents can also be from household cleaners, laundry detergent, fabric softeners and candles. How Can Scents Affect Our Health? Chemicals are used to add scents to products, such as perfumes, cleaning products and candles. Sadly, these chemicals can be dangerous to those with sensitivities to strong scents. For those with severe sensitivities, being exposed to harsh smelling products can hurt their health and result in them having a severe flare up. Scents enter our bodies through our skin and our airways, which is how it can cause a dangerous reaction. As scents reach the skin, it is absorbed into the body, and as it causes a reaction, symptoms such as headaches, dizziness, fatigue, shortness of breath, nausea, cold-like symptoms and worsening asthma symptoms can all occur. The same goes for inhaling the scent, as it can reach the lungs faster and can lead to similar symptoms and possible lung inflammation. Not only can reactions to strong scents be an issue, but allergic reaction to scents can also be extremely dangerous. Many chemicals that are used as scents in products are either natural or man-made chemicals. Normal perfumes and cologne can consist of up to 350 different ingredients, which is believed to be the cause of irritation in those with sensitivities. Medical professionals believe that you are more likely to get irritation from the chemicals that produce the smell compared to the smell itself. Some chemicals such as diethyl phthalate, which is used in perfumes and cologne to make the scent last longer, are known to cause allergic skin reactions. Even if the product claims to be fragrance-free or unscented, it doesn’t mean it truly is. Legally, companies can mark their products fragrance-free or unscented if the right criteria is followed. The term fragrance-free can be used only when no additional scent was added, while unscented can be used when a masking agent is added to the product to mask all other chemical scents. If you have concern over scented products in your home, you can look into making your own cleaning products. If making your own products seems too be a hassle, turn to products that are listed fragrance-free as they are better for your health compared to unscented products. When using personal products, check to see if products you use are safe here. This website lets you search thousands of products to see their rating on the safety of each product. They rank the safety of the product based off of the chemicals used in the product. If the products you are using for your home are too strong for you, try alternatives. When cleaning your home, use more natural unscented products, such as baking soda. 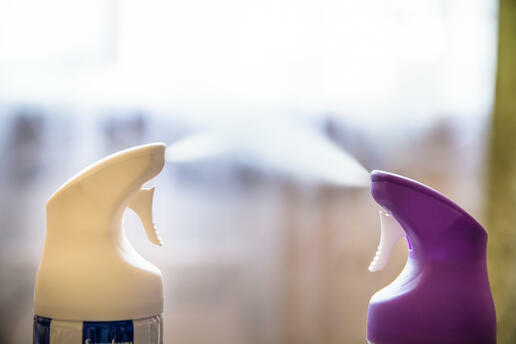 If you are trying to deodorize a room, don’t rely on candles and air fresheners, but put a box of baking soda in the room to help absorb odors (keep out of reach of pets and children) or open a window (if the weather allows). If candles are a must-have in your home, turn to unscented beeswax, soy or palm oil candles, as they burn cleaner and produce less soot. If your workplace does not have any scent-free policies, speak with your boss about adopting a policy to lower the amount of scent you are exposed to. If you decide that you cannot live without perfume and cologne, we have a few ways to lower the amount of exposure you have to it. Always use perfume and cologne in a well-ventilated area and avoid applying it in your bedroom. Wear a lighter fragrance in the summer heat, as heat can intensify fragrances. 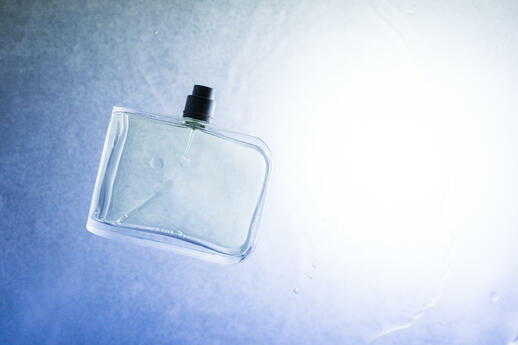 Most importantly, use less perfume or cologne, as wearing too much can be over-bearing for you and those around you. One spray on the inside of the wrist should be enough for your entire body, simply spray your wrist, rub both wrists together and go about your day. Smell sensitivity can be very serious for those with asthma and COPD. Knowing how scents can trigger a flare up, as well as how scents are made are both key to understanding how to avoid it. In your personal life, cutting back on personal perfume use or home chemicals can limit exposure to the scents that can trigger a flare up. 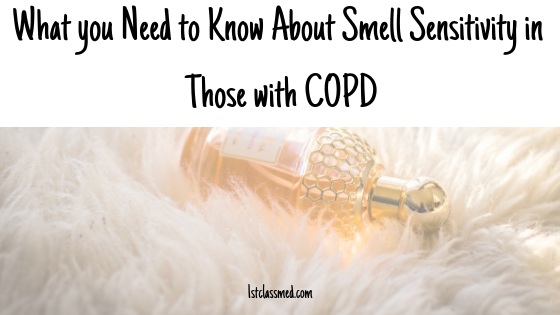 Even though some people with COPD or severe asthma may not have smell sensitivities, those that do can have severe reactions when near a strong perfume/cologne.